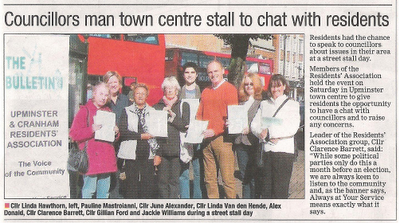 I'm in the Romford Recorder, page 41, with Upminster and Cranham Residents' Association councillors. This was an eye-opening day talking to local residents about what concerns them in the area. I spoke to one man who used a mobility scooter, and he told me the pavements are uneven and sometimes difficult to get around. 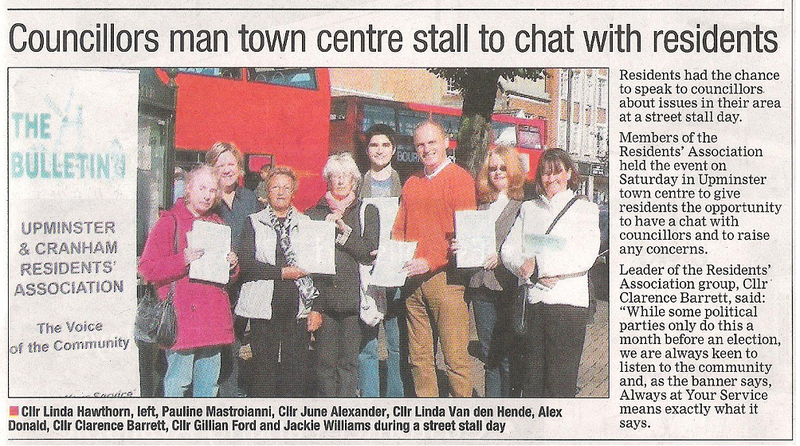 An estimated 14,000 adults in Havering have a disability, and I think it's vital that those residents have the same opportunity to access our borough as non-disabled people. I passed on his details to the councillors. A number of residents complained about the council's car parking charges in Upminster Park. I explained how RA councillors had fought tooth and nail against the proposals and also fought for free parking at Christmas. Sadly the Tory-dominated council rejected this affordable proposal and residents lost out, but our councillors continue to push this issue and stand up for council tax payers' interests. THE SHOW MUST GO ON! ...mustn't it?